A few days ago, Nelliena Moetului, Special Event Coordinator of Innovative Events, orchestrated the unveiling of Moon Mansion. Located in North Bend, WA, this magnificent property is the perfect place for an upscale wedding in a secluded setting. If you’re looking for something off the beaten path, take a peek at Moon Mansion. Boy did we find a great service to add to a wedding day celebration! Based out of Graham, WA, Country Wagon Carriages offers a high-end horse drawn carriage experience not to be missed. Want to have a horse drawn carriage sweep you away from your church, but think your reception is too far away for an equine experience? No problem! 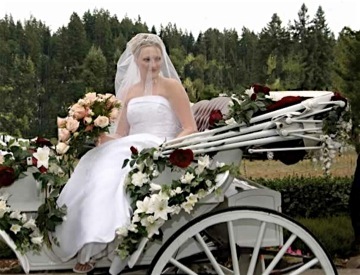 We can arrange to have our motor-powered vehicle waiting a mile or two from the ceremony, so you can make a horse drawn carriage getaway, but finish your trip to the reception hall in the comfort of a chauffeured limousine. WordPress generated this page with 29 queries, in 0.543 seconds.